Mercedes-Benz is taking direct aim at the BMW 3 Series with plans to add a convertible, diesel and hybrid-powered sedans to its C-Class line-up. According to Automotive News, the German-based automaker plans to add the new models after the car is redesigned in 2014. 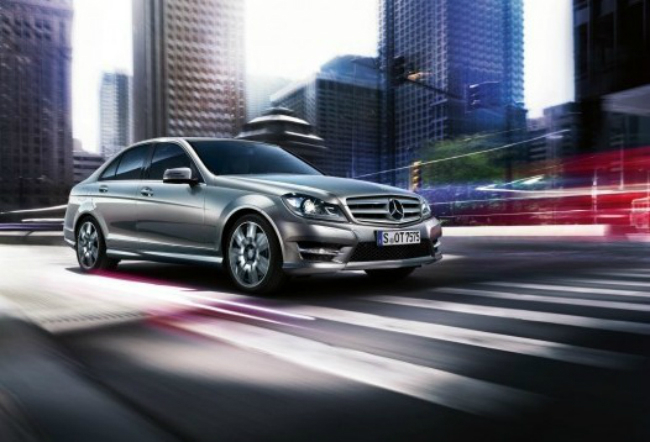 Currently, the Mercedes-Benz C-class is only offered as a sedan and coupe and only with gasoline engines. By comparison, BMW’s 3 series line-up includes a coupe, convertible, station wagon, diesel and hybrid models. “We were fighting the 3 series with two arms tied behind our back, and now we will change that,” Mercedes-Benz USA CEO Steve Cannon told AN in an interview. According to the AN report, the new C-class sedan, which is expected to feature a number of new styling elements over the 2013 model pictured above, will go on sale in August 2014. A redesigned coupe is scheduled to follow in early 2015. The convertible model will go on sale in 2015 with a diesel and hybrid model roll-out shortly after. There are also plans for an all-wheel drive option. The AN report indicates that Mercedes-Benz has no plans on selling the redesigned C-class station wagon in the US because of the low demand for the wagons. Cannon also said Mercedes-Benz will not build a C-lass line to compete with the BMW 3-Series GT that debuts next year, saying the vehicle is “an answer to product question no one is asking,” according to Automotive News. Cannon also told Automotive News that because the new compact CLA sedan will now be Mercedes-Benz’s new entry-level car there are no plans to offer a C-class version with less content to compete with the new $33,445 BMW 320i. Cannon also confirmed that only the 2.0-liter turbocharged variant will be used in the C class for the US.